Does an increased awareness of catastrophic “tipping points”, really trigger political action? This critical question relates to a suite of resilience related research fields, ranging from early warnings of catastrophic shifts in ecosystems, non-linear planetary boundaries, and the role of perceived crisis as triggers of transformations towards more adaptive forms of ecosystem governance. The answer might seem quite straight-forward: “yes!”. Why wouldn’t political actors try to steer away from potentially devastating tipping points? Political philosopher Stephen M. Gardiner elaborates the opposite position in a very thought-provoking article in the Journal of Social Philosophy (2009) about the moral implications of abrupt climate change. 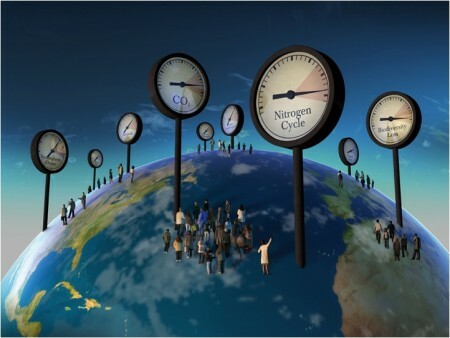 According to Gardiner, several economical, psychological and intergenerational dilemmas make it likely that an increased awareness of devastating “tipping points”, undermine political actors’ work towards effective climate change mitigation. Instead, it induces them to focus on adaptation measures, and involve in what Gardiner denotes an “Intergenerational Arms Race”. In addition, according to Gardiner, in facing abrupt climate change, there will be other more urgent concerns than climate change mitigation, again creating greater risks for future generations. [T]he proximity of the abrupt change may actually provide an incentive for increasing current emissions above the amount that even a completely self-interested generation would normally choose. What I have in mind is this. Suppose that a generation could increase its own ability to cope with an impending abrupt change by increasing its emissions beyond their existing level. (For example, suppose that it could boost economic output to enhance adaptation efforts by relaxing existing emissions standards.) Then, it would have a generation-relative reason to do so, and it would have this even if the net costs of the additional emissions to future generations far exceed the short-term benefits. Given this, it is conceivable that the impending presence of a given abrupt change may actually exacerbate the PIBP “the problem of intergenerational buck passing”], leaving future generations worse off than under the gradualist paradigm. In my view, if we are to solve this problem, we will need to look beyond people’s generation-relative preferences. Moreover, the prevalence of the intergenerational problem suggests that one set of motivations that we need to think hard about engaging is those connected to moral beliefs about our obligations to those only recently, or not yet, born. This leaves us with one final question. Can the abrupt paradigm assist us in this last task? Perhaps so: for one intriguing possibility is that abrupt change will help us to engage intergenerational motivations. That was (another) grim read — thank you for bringing it to our attention and making the original paper available. Three issues began to bother me as I read the paper. 1) There is a scale-dependent aspect to our characterization of climate change as “gradual” versus “abrupt”. Imagine a 500 year long curve of the increasing costs of climate change. The overall average could be a straight “gradualist” line. Higher resolution data making up the curve could be a series of “abrupt” stairsteps. Given multiple potential thresholds (layed out nicely in the article) climate change is always “In the Cards” but also the “window is always open.” The Card Sharps Dilemma? The paper gives us a frame to think about this so it is somewhat addressed. 3) Mitigation and adaptation are not mutually exclusive. Take re-forestation with agro-ecological projects in the tropics. They are mitigation by reversing land-cover changes in an effective area to do so. If they are supporting non-fossil fuel based food system development they are also adaptation measures to energy scarcity, food system disruption, and other correllaries of the effects of climate change. The psychology of changing behavior is improved if we can give people some options that are not just grim trade-offs. @Michael: very nice points, I was thinking the same way (although not as clear as you present it). Would be nice to read some longer elaboration that takes Gardiner’s argument seriously, but that really tries to unpack some possible intergenerational win-win:s, i.e. initiatives that break the mitigation-adaptation dichotomy, and bring both immediate and long-term benefits.